I thought I’d try to emulate Becky’s theme of pink photo this morning, but add a touch of Johannesburg to the mix. As dusk arrives, the somewhat forlorn cry of the Hadeda Ibis is an ever familiar feature of many a South African suburb. These large birds will spend the day grazing in urban parks, golf courses and even larger gardens if there is enough grass. But come sunset they all fly home – wherever their home is – to roost. 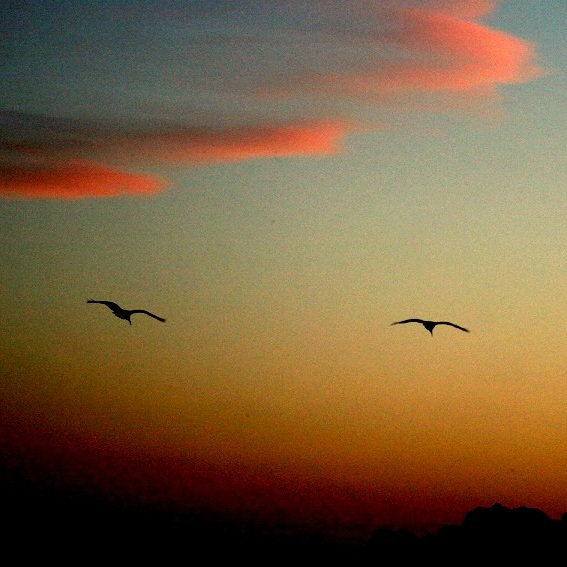 In this shot, a pair of Ibis are silhouetted against the evening sky, as pink clouds move sedately westward. Previous Why you shouldn’t climb into the van even if the man offers you sweets. Next 13: There be Pink Dragons! Oh the melancholic cawing of hadedas. I so miss that sound. Lovely photo too. I could tell the birds were hadedas too before I read the words. Well, as you are my Out of Africa pal, I would be surprised if you didn’t. I’m sure the memory of their call still lingers. Oh yes. I wrote an ode to it once! Really? You should post it. I’d like to read it. If you haven’t got a shot of the bird in question to compliment the ode you can nick one of my Hadeda photos if you like? You read my mind exactly with that kind offer, Ark. I will ponder on’t. i.e. dig out the file from depths of computer. I would of course credit your pic – a Tish-Ark/Ark-Tish production. We should definitely go with Tish/Ark. ArkTish sounds like it comes from the mouth of a drunken polar explorer! Or someone whose false teeth just fell out! Makes me want to sprout wings and follow them. Strange that I do not recall the Hadedas in Johannesburg or Cape Town, but clearly remember them in Durban’s Botanic garden and the Eastern Cape. What I do remember in Johannesburg were the “Piet-my-vrou” calls. I loved those. Some kind of cuckoo I think. The Hadedas are regular visitors to our spot and are never bothered by our dogs or cats. They wander back and forth over the lawn and through the veggie patch. I have never seen the Red Chested Cuckoo (“Piet-my-vrou”) and I don’t think it has ever visited our garden – more’s the pity. On just two occasions we have had visits from a Diderick Cuckoo, who has laid an egg in a Cape Weaver’s nest. I have undeveloped photos (still) on my old Olympus of the Weavers feeding the chick! I don’t think I ever saw the cuckoo, just heard its distinctive cry. oh this is beautiful. What a fabulous shot. Thank you,Becky. Your challenge is bringing out the creative. Loads of fun.